A flavorful meal of Korean-seasoned farm share vegetables and chicken thighs, grilled and served with bok choy and rice. Told ya I was throwing the farm share on the grill! I may not be superstitious but I do believe in signs. When I read a recipe for bibimbap and learn that the secret is a spoonful of Korean hot pepper bean paste (gochujang) which keeps for a while once opened, in the fridge my brain makes a mental note "get gochujang". 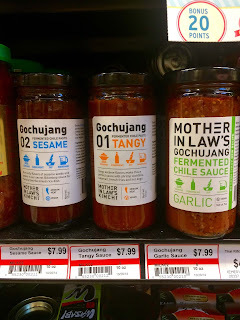 When I read an article calling for gochujang to make sweet & spicy grilled vegetables and chicken thighs right when I've got the veggies from the farm share--I just go for it. Even with a too small grill (this was last year). This recipe makes a pretty snazzy meal, a departure from my usual simply seasoned & grilled goodies. This complex flavor is deceptively simple--you throw some stuff in a bowl, whisk it together, pour it into 2 bags, dump prepped veggies and chicken into those bags, throw them in the fridge and walk away. 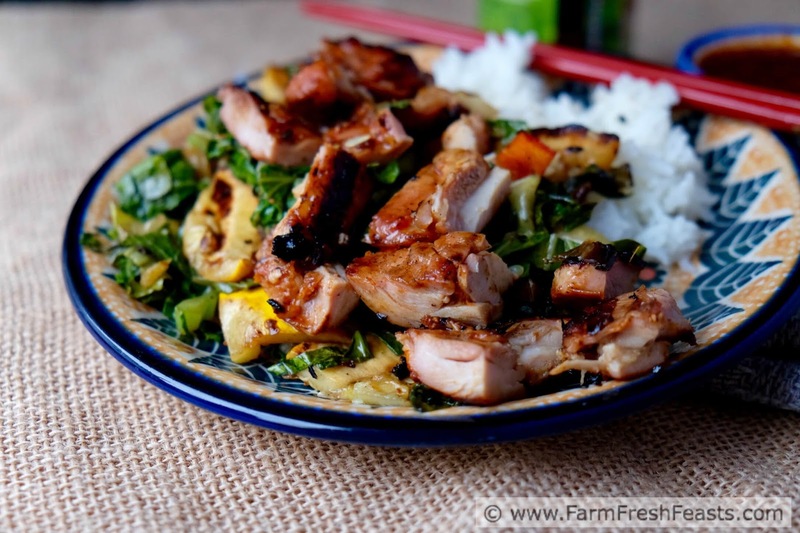 When you're ready to cook, fire up the grill and the rice cooker, do a bit of work on the stove (or use your grill as a summer kitchen) and you're sitting down to a flavorful meal pretty quickly. 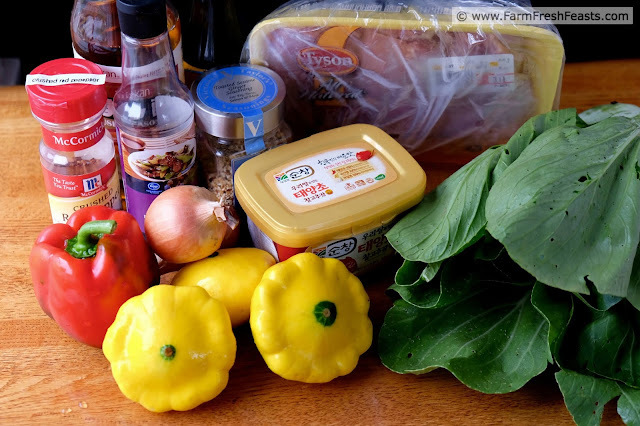 For other recipes using patty pan squash, please see my Summer Squash Recipe Collection. For other recipes using peppers, please see my Pepper Recipe Collection. 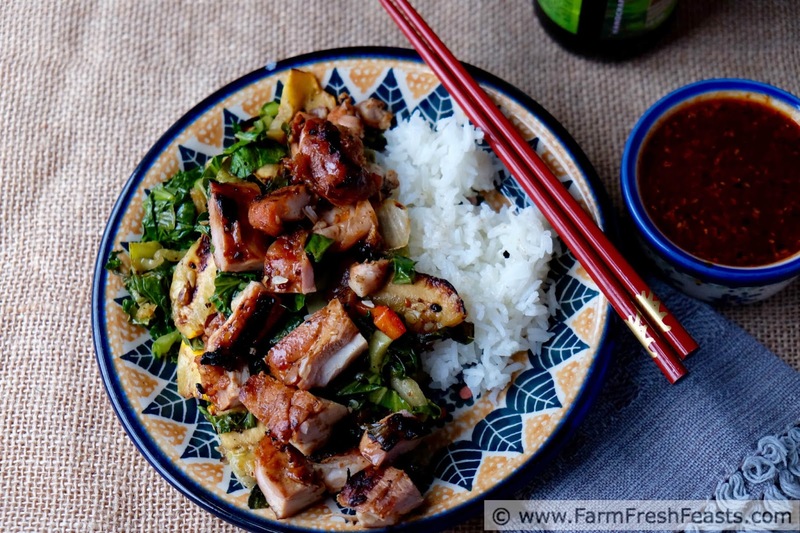 For other recipes using bok choy, please see my Bok Choy Recipe Collection. These collections are part of the Visual Recipe Index by Ingredient, a resource for folks like me looking for ways to enjoy the produce from the farm share, farmers market, or generous gardener. Note: after seeing Jennifer's recipe for Bibimbap, a dish my spouse enjoyed while he was stationed in Korea, I sought out a tub of gochujang. And sought and sought. I was too skeered to ask someone in the Cincinnati Asian Market, but while visiting my folks I picked up a tub from an end cap display at one of the DC area Asian chain markets. Then I went back home to Ohio and saw tubs of gochujang in the commissary and in the large Kroger. Don't know how I missed them before. At my little grocery store down the road they sell bottles of a different brand, pictured above. I haven't tried it, but it's another option. Combine all the sauce ingredients in a bowl, whisk well. You should have about 1½ cups. Pour ¾ cup each into 2 gallon size zip top bags. Add chicken to one bag and vegetables to the other. Marinate 8 hours (I did this in the morning and they sat in the fridge all day). Preheat the grill to high heat for 10 minutes, brush the grill to clean any debris, and reduce heat to medium. While the grill is preheating, slice the bok choy stems into thin moons and the leaves into ribbons. Set aside. Drain the sauce from the vegetable bag and bring to a boil in a small saucepan. Boil 5 minutes. Set aside. Preheat a large skillet over medium heat. Add a turn of oil. When the oil is shimmering, sauté the bok choy stems until softened, about 5 minutes. Add the leaves to the skillet, stir to coat with oil, then turn the heat to low and get grilling. Grill the chicken in a covered grill until fully cooked (internal temp 170 degrees Fahrenheit), flipping after 5-7 minutes when it lifts easily off the rack and has serious grill marks. Remove to a plate to rest. Give the bok choy a stir when you get a chance, and sprinkle it with ½ teaspoon salt and several grinds of pepper. 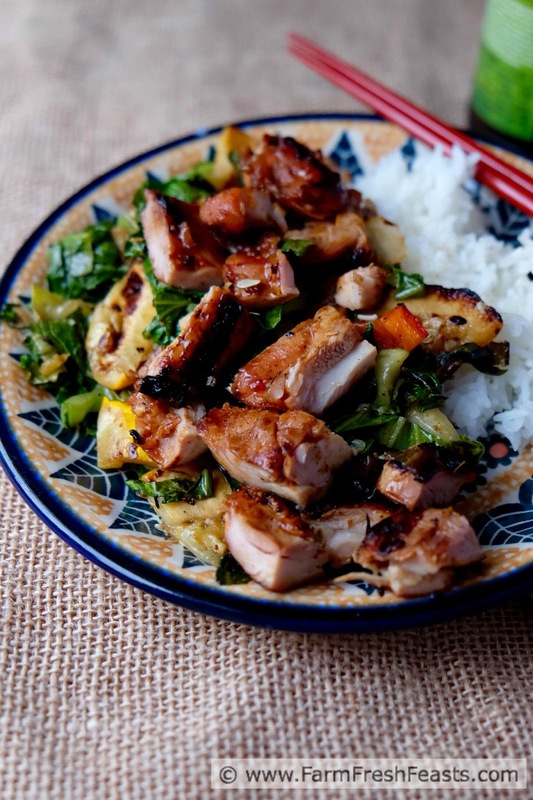 (You can also cook your bok choy on the grill). Keep the onion sections together while grilling, and cook about 7-10 minutes until softened with grill marks. Grill the squash and onions until well-marked, about 8-10 minutes flipping over half way. 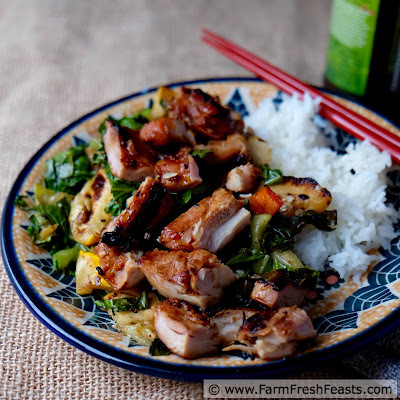 Chop all the grilled vegetables into bite sized pieces and toss with the bok choy in the skillet. Chop the chicken into bite sized pieces. Serve over hot cooked rice, with a drizzle of sauce if desired. If you have any extra sauce, make a Korean Succotash with it. 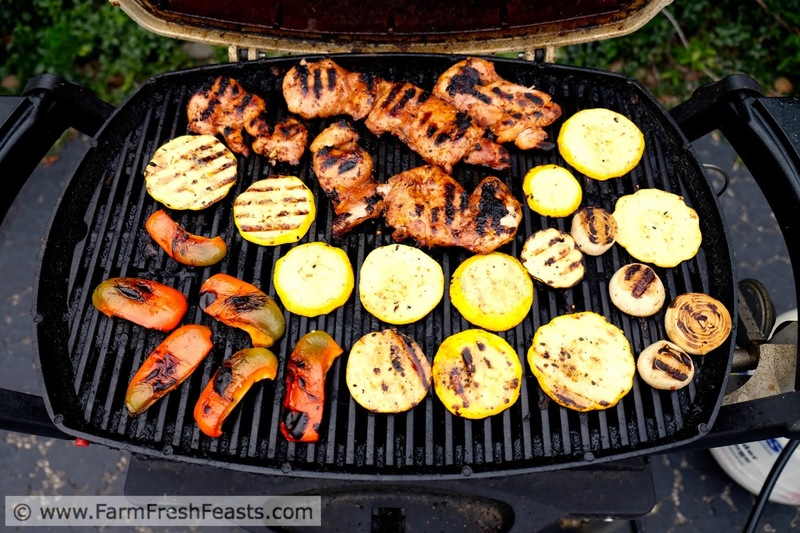 I am all about your new farm share hits the grill series. In fact, I'm reading this outside and I can smell someone grilling right now. Coincidence, I think not. I think maybe a coincidence . . .